Happy Anniversary to us! For the Bread Baking Babes 7th anniversary our Kitchen of the Month, Lien of Notitie van Lien, gave us the perfect recipe for celebrating. 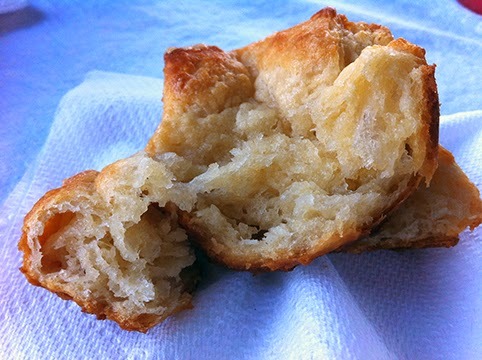 It's an old Celtic butter 'cake' from Brittany France called Kouign Amann and you are going to want to make this one. Better yet, join us by being a Buddy...details at the bottom, before the recipe. It's a laminated dough, so you get lots of lovely layers. It's a butter loving recipe, so use the best butter you can. I used our standard, and pretty good, Clover unsalted butter, but if I make it again I'm going to spring for Kerrygold Irish butter or even something more ultra creamy than that. The taste of the butter and the taste of caramelized sugar are the main benefits here; you really taste the butter. I didn't follow the recipe exactly, but then I hardly ever do. I used a lot less yeast than 5 grams...about 1 gram in fact. I put the liquid into the bowl and then added the dry ingredients slowly as the dough hook did its thing. When it was time to roll out the dough the second time, I sprinkled sugar on top of the butter block before putting it into the fridge. Not such a great idea because the sugar liquefied, which made for a mess when it was time to roll the dough out again. I forgot to sprinkle the final rolled out dough with sugar before cutting it, so sprinkled it on the buns once they were in the muffin tins. Last, but not least, I goofed and cut too many squares, so some of the muffin tin holes had more dough than others. They all ended up being delicious. I love the crispy caramelized crusts on the sides and bottom, and adore the tender layers within. As I expected, Sweetie loved these a lot. They do take some time, but are so worth it. Do stop by the other Babes sites to see what they did with this recipe. 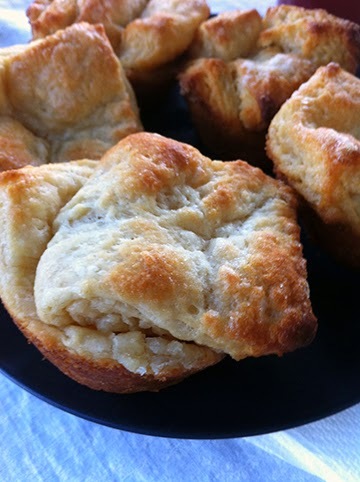 If you want to be a Buddy and get a cool badge for your blog, send an e-mail to Lien with a photo and short description of your baking experience making Kouign Amann. Get it to her by Feb 27th (short month) to be included in the round-up. Thanks for choosing this great treat Lien! 1. Put the flour (start with 300 g) into the bowl of a freestanding mixer fitted with a dough hook. Add the yeast to one side of the bowl and the salt to the other. Add the water and melted butter and mix on a slow speed for two minutes, then on a medium speed for six minutes. Add a little extra flour if the dough is too sticky. The dough should be soft but not sticky (so don’t add to much). 2. Tip the dough onto a lightly floured work surface and shape into a ball. Put into a lightly oiled bowl. Cover with cling film and leave to rise for one hour. 3. Sandwich the butter between two sheets of greaseproof paper and bash with a rolling pin, then roll out to a 14 cm square. Place in the fridge to keep chilled. 4. On a lightly floured surface, roll out the dough to a 20 cm square. Place the butter in the centre of the dough diagonally, so that each side of butter faces a corner of the dough. Fold the corners of the dough over the butter to enclose like an envelope. 5. Roll the dough into a 45x15 cm rectangle. Fold the bottom third of dough up over the middle, then fold the top third of the dough over. You will now have a sandwich of three layers of butter and three layers of dough. Wrap in cling film and place in the fridge for 30 minutes. This completes one turn. 6. Repeat this process twice more, so you have completed a total of three turns, chilling the dough for 30 minutes between turns. 7. Roll the dough into a rectangle as before. Sprinkle the dough with the caster sugar and fold into thirds again. Working quickly, roll the dough into a large 40x30 cm rectangle. Sprinkle the dough with caster sugar and cut the dough into 12 squares. 8. Grease a 12-cup muffin tin well with oil. Gather the dough squares up by their four corners and place in the muffin tins, pulling the four corners towards the centre of the muffin tin, so that it gathers up like a four-leaf clover. Press these corners well together, they can open up when unattached to each other. Sprinkle with caster sugar and leave to rise (room temperature), covered with a clean tea towel, for 30 minutes until slightly puffed up. 9. Preheat oven to 220ºC. Bake the pastries for 30-40 minutes, or until golden-brown. Cover with foil halfway through if beginning to brown too much (and they will). Remove from the oven and leave to cool for a couple of minutes before turning out onto a wire rack. Be careful not to burn yourself on the caramelized sugar, but don’t leave them to cool for too long, or the caramelized sugar will harden and they will be stuck in the tin. Serve warm or cold. Warm is best! If you don’t want to eat them all in want go (or just if you want to, but shouldn’t), bag and freeze them. Before you eat them: Defrost them and place them in a warm oven (180ºC) for about 4-6 minutes or until warm, they will crisp up again. They look wonderfully buttery and flaky. Almost like a Danish pastry. 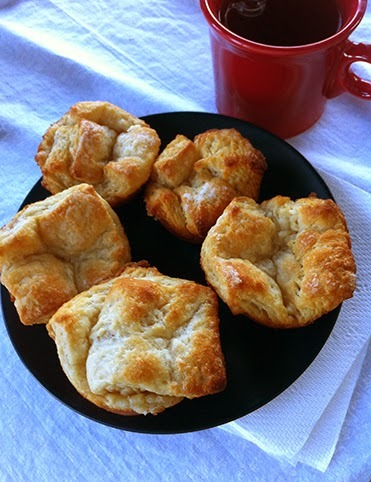 Your Kouign Amann look wonderful! And aren't they fabulous tasting?! We can't believe how good they are. How clever are you to have added way less yeast? I was afraid to do that because of the butter in the dough itself. They look delicious - who needs directions, anyway, right? Creativity! I see your experience was similar to mine. I didn't get the right size squares or the 4-leaf-clover affect. But wow! They tasted good! HaHaHa, you can't divide either! I'm sure dividing the dough into 12 would have yielded more symmetrical clover leafs but hey wasn't it better to get 16 instead of only 12. Next time: salted butter from my Michigan dairy and some of my birthday shaved chocolate!